If you area looking for secluded bay area with wonderful serene view of the water, lush greenery and lot of forested land along mountain slope that offers great nature walks, then Pantai Kok is a great place to stay during you vacation. 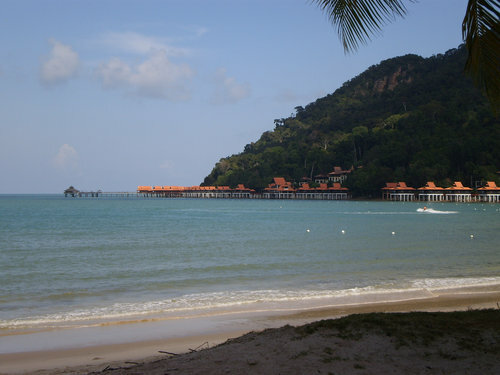 The area lies on the western coast of Langkawi and about 12kms north of Pantai Cenang Area. The public beach, Pantai Kok Beach here is an excellent curved stretch of white sands, which mostly remains secluded other than on the week ends and public holidays when local families come here for picnics. However there are no shops or restaurants on the public beach area. Most shops & restaurants are located at the Oriental Village and Perdana Quay. Both are fairly large open air complexes and located at the Teluk Burau Village area which is an extension of Pantai Kok area. Oriental Village is located at the foothill of Mount Mat Cincinang. There are many quaint shops here selling many different items including gifts & souvenirs, clothing, sunglasses, accessories etc. Several restaurants offer snacks and meals. Perdana Quay is located on the Telaga Harbour Park, overlooking the beautiful harbor which serves as one of the best marinas of the island. You will see many yachts & sailboats moored here. There are several upscale specialty stores here, and many restaurants offering cuisine from different countries like Japanese, Thai, USSR, Arabic etc. They are little pricey though. This place is mostly patronized by the yachting community. Nightlife is mostly concentrated in Perdana Quay and the luxury resorts having bars that stay open till late night. Pantai Kok area boasts of some of the top tourist attractions of the island including the world famous Cable Car ride that takes you to the top of Mount Mat Cincinang offering breath taking views of the rainforests on the mountain slope, birds eye view of Langkawi and its many tiny islands, mountain ranges and a great view of the landscape all around. Other great attractions includes Seven Wells waterfall, Telaga Harbour park, Anna & the King Summer Palace setup etc. There are several Spas in the area including at Perdana Quay and the resorts. The area also offers opportunities for horseback riding, cycling and getting around the Oriental Village and its surrounding area by Segway two-wheel machines. You can also take the Duck Tour from Oriental Village on a duck like amphibian vehicle that offers a tour on both land and water. Water sport activities like jetski, banana boating etc are arranged by the water front resorts. Pantai Kok is essentially meant for luxury travelers. There are five star resorts along the bay area overlooking the ocean and some with their private chalets reaching right up to the water. Couple of them have private beaches as well. Budget travelers unfortunately have few choices here, although there do exist a few nice mid-range hotels and inns in Pantai Kok. In the map below, I have shown both Pantai Kok (marked by the road Jalan Pantai Kok that runs through the area) and Teluk Burau Village (with the road Jalan Teluk Burau) together. Hotels in Pantai Kok: Several luxury resorts mostly on the water front. Attractions in Pantai Kok: Few great attractions including the beach, Cable car and the Sky Bridge. Activities in Pantai Kok: Water activities mostly organized by the resorts. Top Restaurants in Pantai Kok: Few in Oriental Village serving wide range of dishes, and several upscale restaurants of varied cuisine in Perdana Quay at the Telaga Harbor area. Nightlife in Pantai Kok: Bars in the Perdana Quay area. Otherwise most resort bars and lounges. Shopping in Pantai Kok (Oriental Village): Most of the shops (mainly clothing, gifts & souvenirs and also Duty Free) are set up in the quaint Oriental Village complex with open air setting.